Flowers, flowers and more flowers -- can you tell that I am itching for spring? I did keep this alittle cooler than I would have, but I like the turn out. Eastern Blooms in Raspberry, Bay & Melon. Layers of Bermuda Bay, Soft Suede, & Melon. Ribbon is Melon & alittle sparkle on the side just keep it all together. 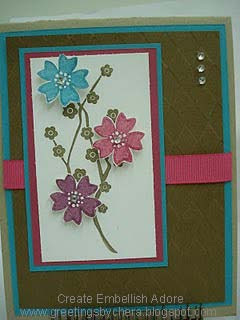 Beautiful card Chera, I love the colors of it and I love Eastern Blooms.